Despite having just released the DSi earlier this year, Nintendo has announced a revised version of the dual camera DS due to be released for Japanese shores by the Christmas season. The DSi LL will sport a larger 4.2 inch screen and will be priced ¥20,000 (US$220). So why redesign the DSi? Nintendo says that this in a response to customer requests for a larger screen. The new DSi LL boasts a 93 percent increase over the DS Lite’s screen size but carries the same number of pixels. The DSi LL is bundled with two touch pens: one shorter and one longer touch pen (129.3mm), and comes will three DSiWare titles pre-installed: Two brain training games (one for humanities, the other for sciences) and DS Easy Dictionary. 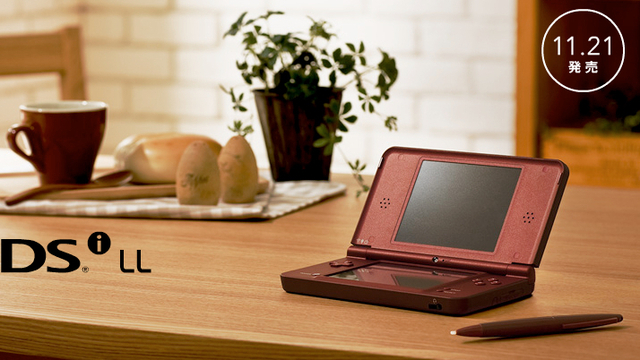 The DSi LL will be available to Japan on November 21, 2009, just in time for some Christams shopping :D. As for the US/EU release, the DSi LL will be known as the DSi XL (makes you wonder what the LL stands for doesn’t it?) and will arrive in the first quarter of the year 2010. Personally I think this is a great upgrade (although technically it’s just a boost in screen size). I’ve been skipping out on the DSi because it’s still has a relatively small screen. The DSi XL might make me jump on the Nintendo band wagon XD. Takers anyone? Sylver repair ur mail – sended you few days ago and yet no reply. It’s there, I just haven’t found time to reply yet sorry 🙁 Too busy atm. I’m thinking of jumping on the bandwagon because of this as well. This boost in screen size is really cool. I don’t think I wanna skip this one.